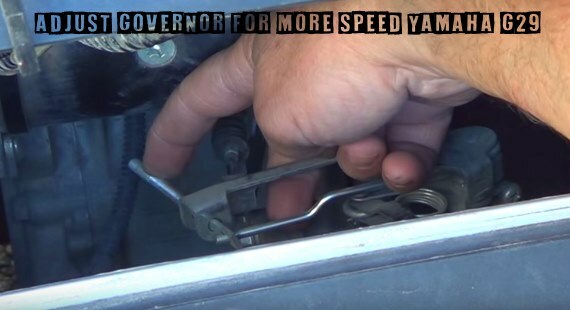 How to adjust the governor to get more top end speed and make your Yamaha G29 gas Golf Cart go faster. This video show you a quick and easy way to increase the maximum speed limit without having to buy anything. This is a basic and easy governor modification for the Yamaha G29 and will also work for the G16 carts. It will bump your top speed from 12.5 to around 17mph. This should not damage your engine if you only make this slight rev increase. Any speed increase above this level could cause increased wear and possible shorten the life of the motor. Any changes or modifications made to you golf cart could possible void your warranty so proceed with caution and do at your own risk. Find Yamaha G29 golf cart part and accessories here.